The French Soleil label has once again reissued a rare and wonderful recording by a little-known band playing avant-progressive rock. Evolving through several players, Dün began life as Vegetaline Boufiol, became Kan-Daar, then Dune, before finally settling on Dün. The various members' influences included Mahavishnu Orchestra (as Kan-Daar they were something of a Mahavishnu cover band), Frank Zappa, Henry Cow, but mostly Magma. The band's active years were from 1978-1981 during which they played shows with the likes of Magma, Art Zoyd, Etron Fou Leloublan, and almost became a part of the short-lived Rock In Opposition (RIO) grouping of bands in Europe, which gives a good idea of the adventurous nature of Dün's music. In 1981 they recorded an LP that apparently never secured proper distribution, and as a result is probably quite rare. The "Eros" reissue includes the four tracks from the original LP plus four bonus tracks, three of which are early demo versions of the tracks on the LP release. "L'epice" declares the trademark Dün sound, being an enjoyable blend of fusion and progressive rock. There are majestic moments that recall Dün's Magma influences but also fiery rocking segments as well. The music segues through multiple movements some of which are carried by the floating qualities of flute and piano, and others that are aggressively led by searing guitar. The compositions are complex and played to perfection by this tight ensemble. 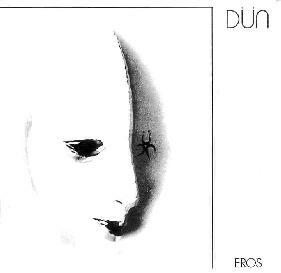 Imagine a more orchestrated version of Henry Cow or Univers Zero and you'll get something like Dün. "Arrakis" begins as a melodic, but still complex, progressive rock piece. Flute and piano carry the main themes for the first several minutes until unexpectedly launching into an intense full band jam. I love hearing piano alongside rock guitar as the instrument is clearly equal in power and potency. One of the bonus tracks is a demo version of "Arrakis". The basic theme is apparent, though saxophone is present and is a more prominent instrument than the flute. The band isn't quite as tight here, the sound being somewhat rawer, but it's still a fiery tune. "Bitonio" is a similar track but includes vibes and cool spacey synths. There's also a demo version of this track, but unlike "Arrakis" I found the demo version of "Bitonio" to be stronger than the LP version. The arrangements are more intricate and the music generally more developed than the LP version. "Eros" is an aptly titled track. A beautiful flute melody takes the lead, but soon develops into a whimsical segment in which each band member plays repeated patterns. The pace slowly picks up though each member is still jamming away in a world that is both cooperative and their own. When the band explodes it's quite intense, and again the Magma influences are apparent though not in a way that overtly sounds like Magma. TIGHT playing from the musicians on this one! The demo version of "Eros" was recorded during the same session as the demo of "Arrakis" and is similar in sound due to the prominent saxophone and style that is closer to jazz than that heard on the LP. Kind of reminds me a little of Gong without the space element. There are lots of these gems from the 70's and 80's collecting dust and thankfully there are labels like Soleil out there digging them up and making them available. Great care is put into the liner notes which include a detailed band history in English and French, and several photos. Recommended to all fans of the RIO scene and avant-progressive rock in general. For more information and a list of distributors you can visit the Soleil web site.